The Sam Leon Bar and Barber Shop in Bodie, California. Photography by Thomas J. Story. 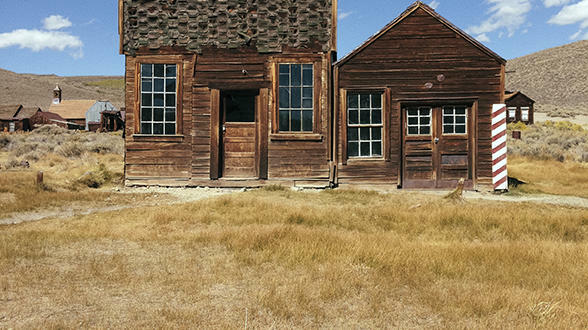 There is something oddly but powerfully alluring about a ghost town--especially Bodie, in California's Eastern Sierra. There is something oddly but powerfully alluring about a ghost town. Perhaps it is the voyeuristic intrigue of a city abandoned but still left standing. Perhaps it’s the chance to witness the magic of Pompeii—without the lava. Some of Bodie’s ghosts are still bottled up. Photography by Thomas J. Story. So last winter, when my friend Norman and I were heading to Manzanar in the eastern Sierra and we came upon the turnoff to the town of Bodie, we surrendered. We drove 10 miles on a paved road, passing no one. We drove another 3 miles over washboard dirt roads, passing no one. In 13 miles, the temperature had dropped from 54° to 34°. If there are spirits here, they are wearing long coats (ghost dusters? )—or freezing their spectral butts off. Bodie offers a window into an earlier era. Photography by Thomas J. Story. Nearly $34 million in silver and mostly gold was mined from the nearby hills, much of it during the town’s brief heyday from 1877 to 1880, when the population approached 10,000 people and 65 saloons lined the mile-long Main Street. Most of the wooden homes and businesses here burned down during major fires in 1892 and 1932. There are just enough buildings left—170 by one reckoning—to make this state historic park bewitching. I loved peeking in the schoolhouse window and seeing the books and chalkboards (still with lessons of them) and the globe from which all the landmasses and oceans have disappeared. We looked into the Boone General Store and marveled at the old coffee grinder and the boxes, bottles, and barrels littering the shelves and floor. But my favorite sight in Bodie was the electrical cord in one home that had been used to suspend a gas lantern from the ceiling. Clearly, this had been a town that wasn’t ready for the wonders of electricity. Anyone else share my fascination with ghost towns? Anyone else want to share a favorite?